2nd Bn, The Seaforth Highlanders (Ross-shire Buffs, The Duke of Albany's) attached to 1st Bn, The Gordon Highlanders, 8th Brigade, 3rd Division, B.E.F. The Malvern News reported on the 5th December 1914: Captain Keith Bethune Mackenzie the elder son of Mr James Mackenzie and Mrs Mackenzie of Woodham House, Horsell, Woking and formerly of Daresbury, Malvern was killed in action near Ypres on the 12th November. 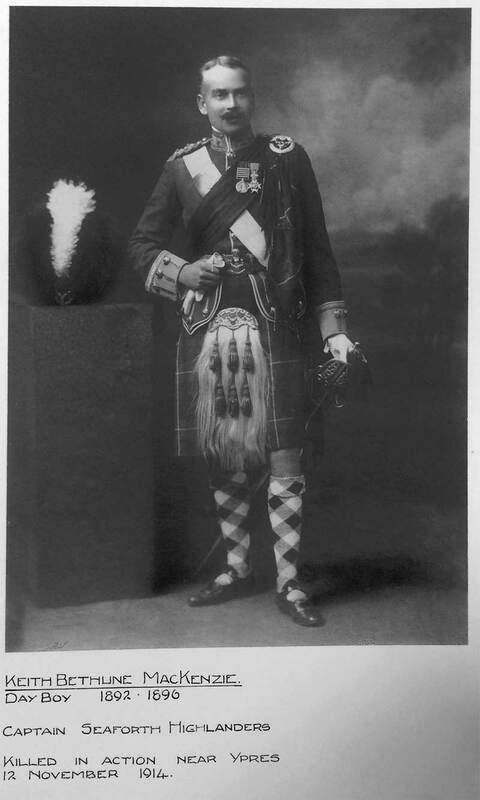 He was a Captain in the Seaforth Highlanders attached to the 1st Gordon Highlanders at the front. He leaves a widow. Captain Keith Mackenzie is remember on Tain War memorial along with his brother Eric. They both attended Tain Royal Academy along with their sister from 1891-1892, staying at Morangie House.